Happy Monday Everyone! And happy Labor Day to all my USA friends! YAY!!! A day off! It’s time for another Technostamper Monday Lunchtime Sketch challenge and Mary Jo has a GREAT challenge for us. 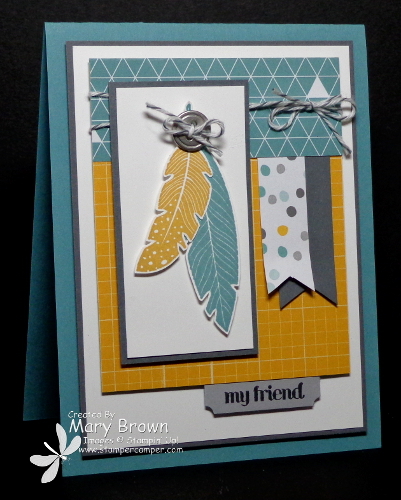 I had been using the Four Feathers set for a project for Create with Connie and Mary Holiday Card “Create”tions this week and since things were ‘sitting on top of my desk’…well…you know me…that means I will always start there! LOL!!! Hello Hello grid dsp (Moonlight dsp Paper Stack) – 3 1/4 x 5 1/4 – score along top 1 1/4″ down and fold over top piece to show back side of dsp. 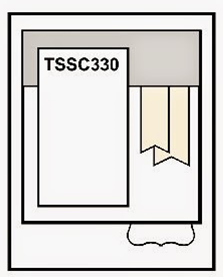 Basic Grey banner – 3/4 x 2 1/4, dotted banner – 5/8 x 2 1/8. Add to grid, fold top piece down and tie White/Basic Grey Baker’s Twine around it. Whisper White – 1 5/8 x 3 1/4. Layer on Basic Grey 1 3/4 x 3 3/8. Add to card front using dimensionals. Tie White/Basic Grey through a Silver Basic Metal Button and add to feathers using glue dot. See what a fun sketch this is. Lots of stuff going on in it! Don’t forget to check out the other members of the team and remember go to the Technostamper blog to play along! 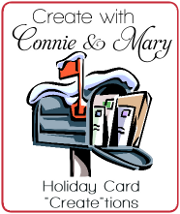 We just started Create with Connie and Mary Holiday Card “Create”tions and now is a GREAT time to subscribe! This time we are doing an ALL CARD collection…how cool is that??? For only $19.95…you will get 3 weeks of ALL CARD IDEAS…always a favorite! One week is Fall/Halloween and two weeks of Christmas! So head over to Create with Connie and Mary to learn more and subscribe today! This entry was posted in Technostamper Challenge and tagged And Many More, Four Feathers. Bookmark the permalink. I really love these colors and you are rocking the feathers. So pretty. Thanks so much for always having such wonderful samples for my sketches.